MTFA Architecture redesigned an existing office building into a high quality residential condominium building on 22nd Street, NW in Washington, DC. Two colors and four different tiles were incorporated to create an head-turning new addition to the neighborhood. With 360 views of the city from 1255 22nd Street's rooftop lounge, this high-end makeover has all of the ammenities you need, clad with a stunning and low maintenance Terra5 rainscreen facade supplied by Cladding Corp. 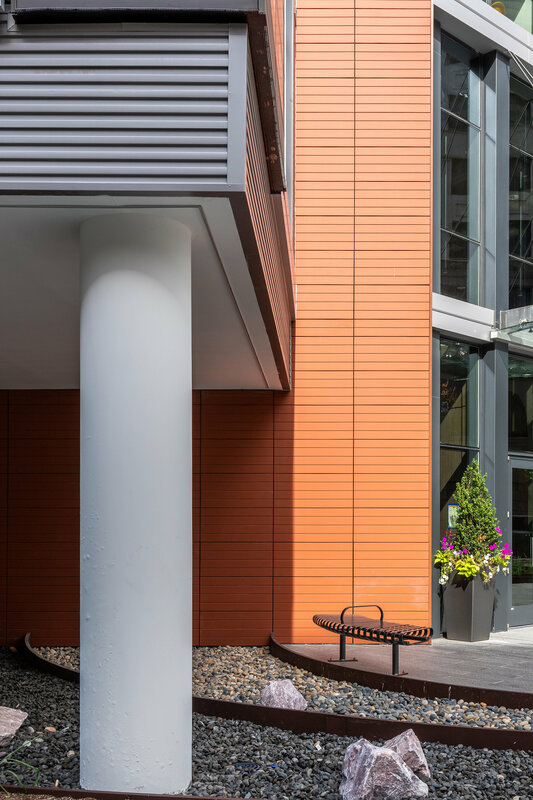 Using the Terra5 TC18 tiles as a cost-effective terracotta solution for the exterior facade, the design team at MTFA featured red and gray panels to create rhythm and interest in the façade, with the balconies and corners using varying grooved tiles. Grooved tiles are a great feature element to vary scale and texture and create a clean, modern visual that is both timeless and contemporary. The building’s design has gained considerable attention for the developer to attract tenants/owners. In fact, the habitable roof spaces boast a green roof that creates an aesthetic rooftop while contributing to the projects storm water requirements.